Prototype answers the question of what happens when you make a sandbox game that not only has little punishment for causing destruction, but encourages it. Where other games would quickly spell game over if you caused havoc on the general population, this game gives you experience and skill points for doing so. But the game is far more than just some murder simulator, there is a point to all the madness you cause. New York. Only slightly more violent than it's real life counterpart. 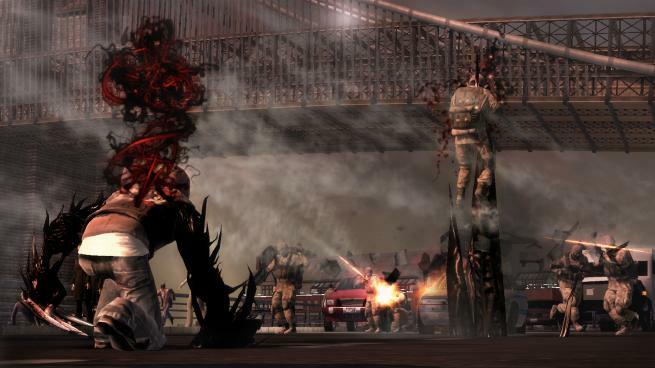 Prototype starts out in a chaotic battlefield in what remains of Manhattan, New York. 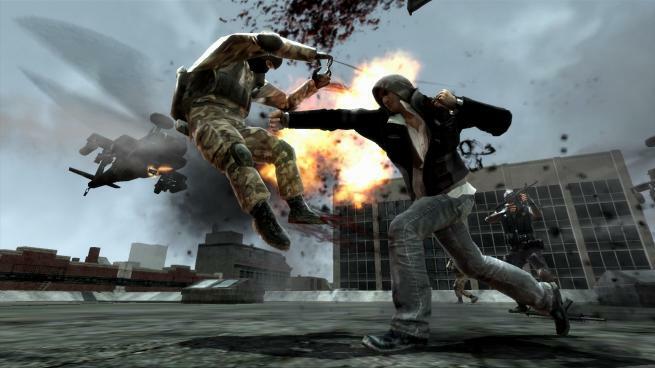 You play as a fully powered Alex Mercer who is fighting both the army and infected citizens. The tutorial type level ends before you get totally overwhelmed by all the powers at your disposal and quickly rewinds to the beginning of the story. Through various flashbacks and flash-forwards, we learn that a virus is spreading throughout Manhattan that turns people into mindless monsters. Alex is also infected with it, but for some reason it has granted him superhuman and shape shifting abilities. Alex also has a nasty case of amnesia, so it’s a good thing he is able to absorb people and their memories which slowly restores his memory as you progress through the game. You can easily travel to the top of any of the buildings. Gameplay is broken up into a series of chapters. Each chapter has one main mission that must be completed before you can move on. However, you can spend as much time doing whatever you want before taking on these main missions. In the early parts of the game, it’ll usually be side-missions that involve killing enemies or running through a small part of the city within a certain amount of time. However, as the game progresses so do the number of things you can do in the open world. You can seek out and destroy infected hives or sneak into and infiltrate army bases. The variety does tend to die down about halfway through the game and you may find yourself skipping it to get to the main mission. Movement is fluid and frustrating at the same time. Alex controls fluidly to a fault. His main method of traveling is simply running and jumping. 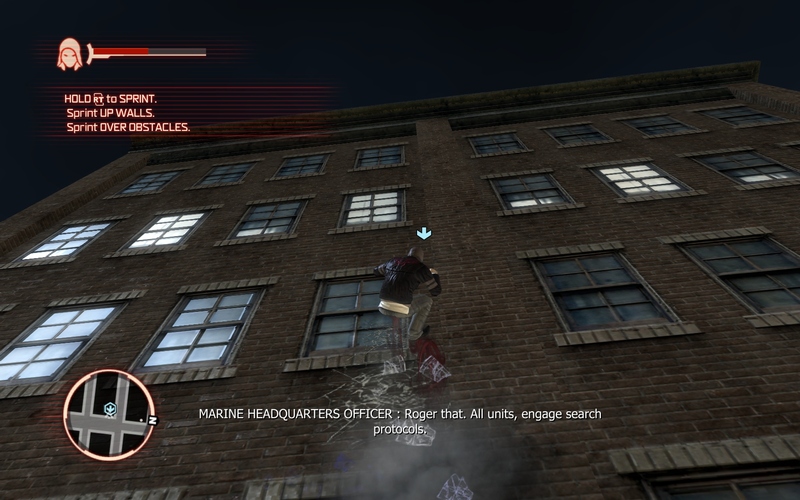 Like a parkour practitioner on speed, he is able to run up the sides of buildings, launch himself over another and glide across city blocks. This method of travel feels very smooth, but you can’t help but wish there was a speedier way to get from point A to point B sometimes. Also, running up buildings is twitchy at times, you’ll be running in a straight line and veering off even in the slightest direction can send you horribly off course. In addition to just running and gliding across the city, Alex can also hijack army tanks and helicopters as well. These tools of destruction add some variety to the basic hack and slash combat, and there is something satisfying about taking down army bases and infected hives with them. Combat is a gruesome affair. Similarly, combat is also fluid to a fault. Alex can shape-shift his body into a number of melee weapons you might expect in any kind of action game, the balanced one, the fast but weak, and the slow but powerful among others. Alex can perform simple 3 hit combos, but things get really interesting when you start powering up your abilities. Nothing is more satisfying than killing off thirty infected with one screen clearing move. Enemies range from one hit kill fodder, to larger beasts that will relentlessly follow you to army tanks and helicopters. Combat will frustrate you at many times during the missions. The problem is you are just one person against numerous waves of enemies. Even with Alex’s powers, he is still within a fragile body. 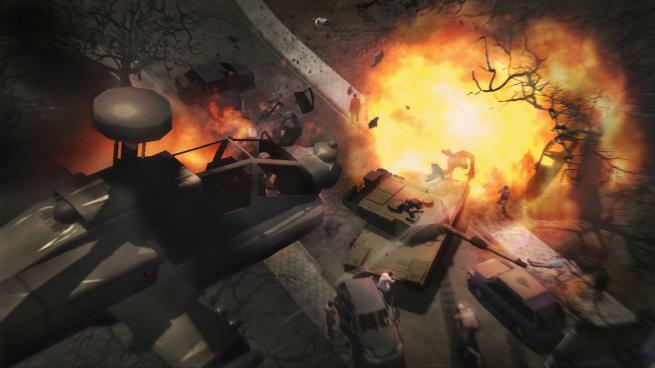 One mission, for example, has you destroying waves of tanks. Normally fighting against one or two tanks is not much of an issue, but when you are trying to handle four tanks, plus infected who won’t let up attacking you, trying to avoid rocket launcher shots and fire from helicopters, you end up the victim of many cheap shots. Most of these frustrating moments are contained within the missions, so you can always get your destructive nature on outside of them and not feel like you’re constantly fighting against an overpowered AI. Destruction from above in a hijacked helicopter. Honestly, the most fun I had with this game was outside of missions. 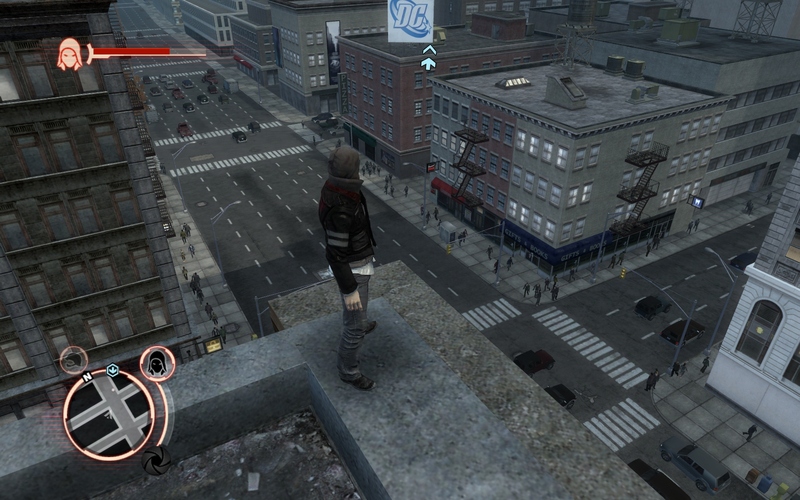 While Manhattan is nowhere near as large as say Liberty City, there’s still a decent amount of space to play around in. However, don’t expect any semblance of realism among its citizens. As you progress through the game, the island gets quarantined off and more and more of the populous come infected. Infected parts of the city are rampant with chaos as the few normal people run for their lives and the army tries to fight off the horde. However, on the flip side, the neighborhoods that remain uninfected always remain calm and collected. They go about their normal lives as if they aren’t trapped on an island with no way of escaping and death just a few blocks away. They also must have seen some amazing things in their days to not react at all to someone running up the side of a building and gliding halfway across the city. 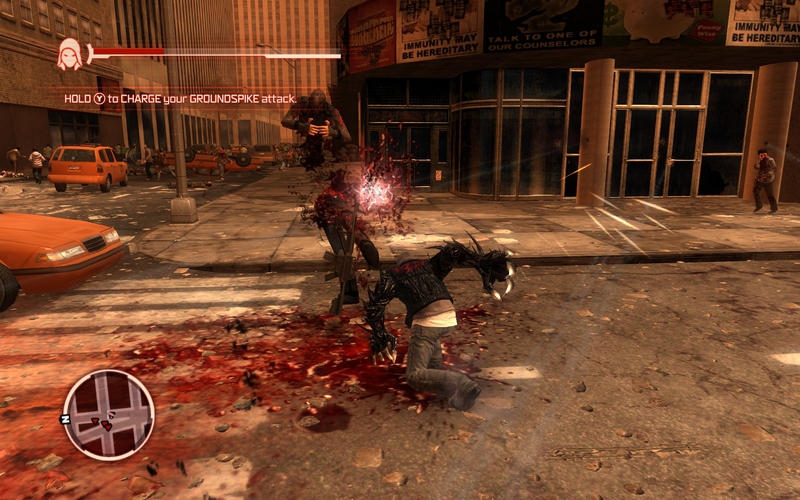 There are worse ways to go in Prototype than getting your ribcage smashed in. Overall the story is what is going to get you through mission mode, and not to spoil the end, but it will probably leave you more confused than anything. The carnage and destruction are really the highlights of this game and to its credit it does it well. However, this charm has diminishing returns and soon you’ll be wishing it had a little more substance. Still, the idea of Devil May Cry meets Grand Theft Auto is merit enough to play the game, just make sure to monitor your stress levels while playing.